Trump’s enthusiasm for peace with Russia vs his acceptance of Cold War II with Russia, launched even as Trump declared victory in 2016. Trump’s virtually declaration of war against the mouse, Canada, next door, with his cutting insult to Justin Trudeau as weak and dishonest, as he left the summit early and refused to endorse its free trade plea. Trump’s original enthusiasm for pulling out of Syria and elsewhere, pursuing an old fashion Republican isolationism, vs his sudden flurry of bombings in Syria recently and the threat of invasion of others (Iran, North Korea, Venezuela). Trump’s dumping of the carefully crafted nuclear agreement with Iran, renewing sanctions and threats in the face of world opposition, both domestic and foreign (ok, the Zionists are happy, but no one else). Trump’s unsolicited ‘deal of the century’ with Israel-Palestine. There are behind-the-scenes forces at work with Russia at the centre. Obama’s and the western media’s human rights spat with Russia over Ukraine and Crimea are not important to the long term strategy of the neocons. Trump and his deep state backers understand this. Kissinger admitted it in June. They want Russia back in a new G-8, as Trump so loudly proclaimed at the G-7 in Quebec in June. But a Russia on the defensive is also in their interests, the better to make Russia bow more respectfully to US world hegemony in any grand compromise. Good cop, bad cop. Trudeau was comforted by his Euro colleagues when called a liar by the bully, but Trump has no time for wimps,* pious words attacking Russia or promoting gender equality and the environment. The ‘grand strategy’ of the Pentagon and neocons is about world control. “His message from Quebec to Singapore is that he is going to meld the industrial democracies to his will — and bring back Russia,” said Steve Bannon, Trump’s former campaign and White House adviser. 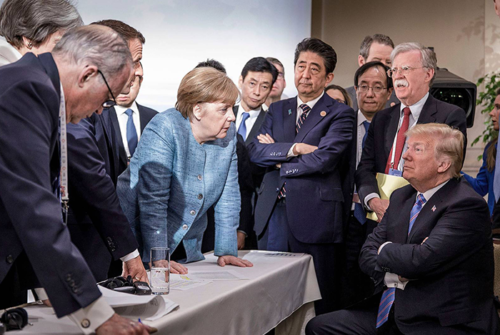 Bannon said China is “now on notice that Trump will not back down from even allies’ complaints in his goal of America First.” What Europeans deride now as “G-6 plus one” would become again the G-8. Russia will dump Iran and China, and be a nice US puppet. There is a reason that neoconservatives are said to be the heirs of Trotsky: Trotsky wanted to export revolution to all countries, whether they were ready for it or not (with the subsequent goal of destroying national boundaries and traditional cultures); Trump’s neoconservatives want to spread neocon ideology to all countries (e.g., globalism, the dominance of western corporations and markets, ‘democracy’, relativising traditional society). The dialectic has come full-circle. In a weird sort of way, the (Christian) US is the anti-Christ to the (atheist) Soviet Christ. Both are/were radical universalists. Putin understands this and is neither a communist nor is he likely to take the neocon bait, as did Gorbachev-Yeltsin. Neither is Kim Jong-un. Trump enthusiast Leon Haider praises Trump’s rejection of a “make-believe ‘peace process’”, replacing it with his “deal of the century”, that counts on moderate Arabs convincing the Palestinians to “take the route towards coexistence” with Israel that will “eventually lead to a peace deal, the deal of the century.” Bully the Palestinians into a deal that they can’t refuse. Trump somehow thinks this bullying will succeed where all of his predecessors have failed. Saudi Arabia is a feudal fiefdom, the source and inspiration of al-qaeda/ISIS through Wahhabism and petrodollars, provided discretely both officially and unofficially (by dissident princes). Its list of human rights violations grows daily, presently torturing its old rival Yemen for no apparent reason. Egypt is being run into the ground by a vicious dictator-general. Turkey, the most important actor, is ignored and isolated over the Kurdish problem. Jordan is in upheaval protesting IMF-backed price increases and a new tax reform law. These countries are hardly poster children for the advantage of being a friend to the US and Israel. The other Arab country, Syria, just barely survived the US-backed insurgency and is back in the anti-imperialist fold (i.e., pro-Iran/ Russia) after 7 brutal years when it was betrayed by ‘moderate Arabs’ (not to mention Turkey). It is my choice as a ‘moderate Arab’, but will continue to oppose the US ‘grand stategy’ for the region, along with a chastened Turkey. Where is the grand strategy here? Bin Salman personally delivered Trump’s secret ‘deal of the century’ to Abbas, who refused to even open the envelope. For Trump’s ‘moderate Arabs’, read: Shia-hating Sunnis, led by King Bin Salman. Their hatred is mostly sour grapes for Iran’s proud defiance of US dictates. Arabs were traditionally the freest of peoples, the heirs of the Prophet, who was no friend of Rome. Those Sunnis would dump the US in a flash if they didn’t need Bin Salman’s billion-dollar bribes, and if there was another patron to feed them. Do they help the US achieve world control, the underlying strategy? Only Israel is more or less happy. It is their ‘grand strategy’ for the Palestinians that is closer. Its goal appears to be to annex the occupied territories unilaterally, set up a Quisling Palestinian Authority to police what’s left of the West Bank, under Israeli control. A variation would be to force Palestinians and Jordan to make the occupied territories Jordanian (but policed by Israel) and make all Palestinians ‘Jordanians’, after first taking most of the desirable bits for Israel. If the Israeli Arabs cause too much fuss, they too can go to their new ‘homeland’ (Jordan West Bank), along with Gazans, once Gaza is declared uninhabitable. Postmodern ethnic cleansing. Not so many deaths, wipe out the refugee problem at a stroke, dispense with the pesky ‘return’ problem. That would leave Iran or Iran/Syria as the target of Israel’s next and final war, not the Palestinians — and the Sunni Arab world will watch from the sidelines, and would not be unhappy to see Iran destroyed. That would allow Israel to proceed with its ‘final solution’ for the Palestinians, once Iran is out of the picture, even as these ‘moderate Arabs’ squawk (or are overthrown). Trump’s summit with Kim Jong-Un in Singapore looks and tastes like Nixon in China, but was it a fraud, the icing laced with artificial sweetener or maybe arsenic? Surely Kim realizes that he must hold out for the closure of US bases in South Korea, as only that could possibly guarantee denuclearization of the peninsula. And why no mention of Iran in all the hype, let alone a stopover in Tehran, if denuclearization is the real issue? It appears that by allowing the interventions in Yugoslavia, Libya, Afghanistan, Iraq, etc. (R2P responsibility to protect), the so-called international community did only one thing, it created more possibilities for new interventions, interventions that promote western control; i.e., imperialism. Russia will have no truck with this, as it is not interested in promoting western imperialism. Libya was the last straw, and instead, Russia moved on its own to help stabilize Syria without these dubious ‘protectors’. The disasters these interventions have resulted in means it is unlikely they can be repeated, despite Pence’s warning to Kim that he might end up “like Libya”. Probably Iran is safe, given Russia. Peace with Iran would knock some sense into both the Saudis and Israel, and would curb the lust for war. The Saudis would fume, maybe instigate some terrorism themselves, but they are so tightly knit in the US orbit, this could be managed. Israel has its Jerusalem but nowhere to turn to. Israel’s life blood — Jewish Americans — are increasingly hostile to Israel, given its murderous policy of expansion. The fallout from such a truly ‘grand strategy’ would benefit both the US and the world, as the US and Russia revive their ‘grand compromises’ of the past (WWII, 1960s–70s detente). A ‘grand compromise’ for Turkey’s, Iraq’s and Iran’s Kurds could finally be addressed. Devastated Syria and Iraq would not be distracted by US-Iranian hostility and would rebound quickly. Iran’s only pretension internationally is to help the Palestinians, though the US did leave a vacuum in Iraq with the destruction of that state, and Iran is now playing its logical role as supporter of Shia next door and as a good neighbour. “Don’t hold your breath,” writes Stephen Walsh in Foreign Policy. Making peace with Iran would require Trump (and Congress) to ignore the lobbying and propaganda emanating from the Israeli and Saudi lobbies. But after the recent Israel massacre of Gazans, and given the ordinary American’s distaste for the Saudis and their massacre of Yemenis, there is no better time. Congress is not lying down. The sole Muslim congressman, Keith Ellison, put together a nonpartisan amendment of the National Defense Authorization Act to specifically prevent the president from launching war against Iran without congressional authorization. Even if the Ellison amendment survives the Senate, Trump could ‘pull a Trump’ and violate it. He could target Iranian individuals as “suspected terrorists” on his global battlefield and/or attack them in Iran with military force under his new targeted killing rules. It does not prohibit the expenditure of money to attack Iran. Nor does it proscribe the use of sanctions against Iran. But it shows that Trump does not have a blank check for his ‘grand strategies’. Nor are the ‘good’ Jews in the US, energized by Israeli atrocities, silent anymore. A groundswell of Jewish protests is making room for the rest of Americans to brave the Zionist thought police. It is complicated piecing Trump’s grand strategy together, partly because he is a loose cannon, with his own self-aggrandizing agenda, and partly because of the chaotic conditions and opposing forces elsewhere. He is gambling on using good-cop/ bad-cop with Russia, plain old bad-cop with Iran and North Korea, to achieve his ends. Gunboat diplomacy. The US (and more so Trump’s) unreliability as a representative of US policy, willing to tear up treaties, makes it unlikely that Trump’s fish will bite. Israel’s strategy is also unlikely to prevail. Young US Jews** are already getting arrested protesting Israeli actions, much like they did in the 1950s–60s when they virtually led in the civil rights movement for blacks, and again in the 1980s, when they backed the anti-apartheid struggle. Then, their Jewishness was downplayed, but in this last war, they hold the trump card to successfully fight Israel, and must speak out for peace. As for Russia and Iran, Trump finally got some cajones and defied his backstabbers, not only meeting Putin, but out of the blue declaring he will meet Iran’s President Rohani, “no pre-conditions”. This is now a ritual for him facing off against his ‘enemies’: threaten to invade (Kim the Rocketman, NEVER, EVER THREATEN THE UNITED STATES AGAIN OR YOU WILL SUFFER CONSEQUENCES THE LIKES OF WHICH FEW THROUGHOUT HISTORY HAVE EVER SUFFERED BEFORE) and then coolly agree to negotiate. ** IfNotNow is the latest, composed of Jewish teens. This article was posted on Sunday, August 5th, 2018 at 8:31am and is filed under Canada, Donald Trump, Egypt, Iran, Iraq, Israel, Jordan, Land Theft, Massacres, Media, Militarism, North Korea, Palestine, President Kim Jong-un, Propaganda, Russia, Saudi Arabia, Syria, Turkey, United States, US Hypocrisy.